Adam Duritz, a Jewish Policeman, is charged with the duty of selecting five people each day to be transported to Treblinka – or else he will be selected himself. Thomas Abendroth is a German soldier, trying his best to retain his humanity in the inhumane ghetto. Thomas befriends Adam. Both men make enemies of other people in power though. Yet, far more than his friendship with the German, Adam realises that his salvation resides in his love for Jessica Rubenstein. If he can save her, he may also save himself. Their fates – and those of others – will intertwine and be decided during a climactic evening on the streets of the ghetto, where love and tragedy abound – and collide. 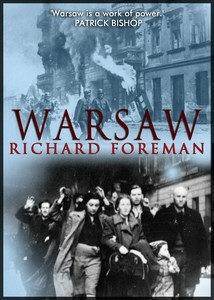 Warsaw is a novel which lingers long in the heart and mind. For fans of Dostoyevsky’s Crime & Punishment and Thomas Keneally’s Schindler’s Ark.